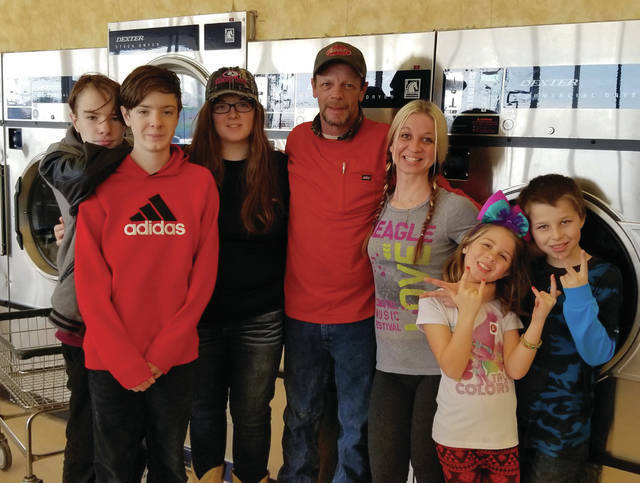 Whitney Kretz and two of her children, Nadka and Johnny, and colleague John Streetman with his children, Crystal, CJ, and Daniel at the Dvine Intervention’s free laundry wash in Wauseon. Dvine Intervention is a nonprofit organization that was recently established by a Whitney Kretz, a single mother who was helped, and wanted to give back. Going to Northwest State Community College gave her the resources to understand non-profit, how it works, and the help to obtain the organization. On Jan. 27, Dvine Intervention held its first event. With the help from various donations from the community, Dvine was able to help serve and pay for other people’s laundry. Kretz, a Wauseon graduate, went to Star Brite Fabric Care Center on Shoop Avenue, stood on a chair and announced they would be paying for everyone’s laundry that afternoon. From 1-3 p.m. they spent $400 in quarters, serving 43 families, and loving every minute of it. Beside Ms. Kretz stood two of her children, Nadka and Johnny, and also a colleague John Streetman with his children, Crystal, CJ, and Daniel. Dvine Intervention is an uprising organization with lots of knowledge and experience to offer to people who need a little something extra. They help others gain knowledge of the resources out there to help get back on your feet. For more information visit Dvine Intervention on Facebook or email Kretz at 20dvineinterventions18@gmail.com.